International Journal of Research in Health Sciences,2015,3,1,225-229. 1-Associate Professor, Dept. of Anaesthesiology, Mamata Medical College. 2-Consultant Anaesthesiologist, KIMS, Hyderabad. 3-Professor & HOD, Dept. of Anaesthesiology, Mamata Medical College, Telangana, INDIA. Objective: To compare the amount of drug used during infusion (0.75ug/kg/min) with that used during the intermittent bolus (0.1mg/kg) and to compare the characteristics of recovery from neuromuscular blockade after injecting vecuronium either by infusion or repeated bolus. Materials and Methods: Sixty female patients undergoing gynecological surgeries lasting 90 minutes or longer were included. The degree of neuromuscular blockade was measured with a train-of-four (TOF) test. TOF% was measured and recorded every minute for 15 minutes and thereafter at 15 minute intervals till surgery was complete. After the initial recording of TOF%, the intubating (loading) dose of vecuronium bromide (0.1mg/kg) was given. The time intervals from reversal to TOF ratio of 25%, 50% & 70% were recorded. Extubation was done when TOF ratio was 70% or more. The amount of vecuronium wasted was calculated. The data between the two groups were analyzed using student’s t test. Results: The amount of vecuronium used in both groups was comparable. The wastage of vecuronium was also compared, which is not statistically significant. In patients receiving intermittent bolus injections, the recovery time from reversal to TOF ratio of 25%, 50% & 70% was faster when compared with patients receiving infusion. 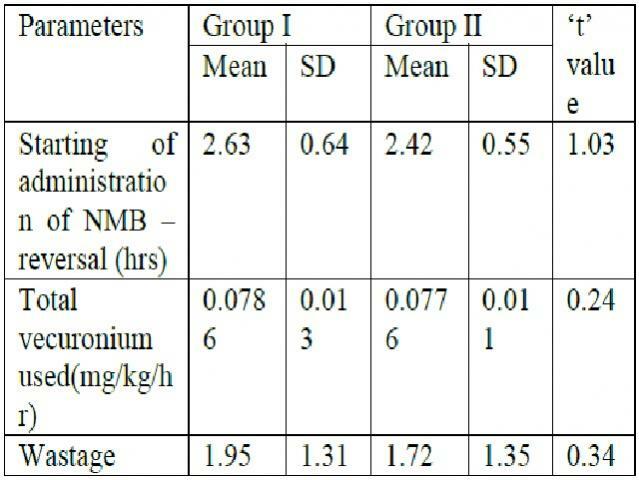 Conclusion: Vecuronium infusion offers a stable degree of relaxation for long surgical procedures. This avoids fluctuating degree of neuromuscular blockade and the need to administer frequent bolus doses. Recovery from neuromuscular blockade in the infusion group is longer when compared to the intermittent group but clinically not significant.